Age: Appears to be in his 20's, possibly up to 60 years of age. Looks: Tends to wear a creepy, long smile. Has blue pupils below his rarely opened eyes, and has long silver hair covering most of his head. 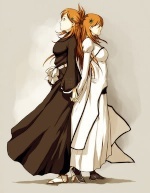 In the arrancar arc, he wore a long white kimono like Aizen did, but in his shinigami days he wore a normal captains haori and a normal shinigami kimono. Rank: The former captain of the third division, and seemingly second in command in the arrancar war. Zanpakuto Appearance: A normal katana. Shikai Appearance: Its still a normal katana. Shikai Ability: Now, this is when its actually interesting. With his ability, triggered with the words, "Shoot to death." He can extend his sword an unknown distance, but, although it can be extended incredibly far, its not the distance that's to be astounded at, its the speed at which it can cover the distance. His shikai seems to be able to be used whenever he wants, and takes little to no reiatsu on use. Bankai Appearance: The same sword, only able to extend longer. Bankai Ability: This time, his sword grows not only gets a longer distance to cover, but also extends, and withdraws even quicker than before. But, thats mainly just to make the enemy not notice the real problem if you actually get hit with it. After seperating a piece of his zanpakuto which contains a incredibly poisonous mineral, most likely matching up to that of even Soi Fon's suzemebachi, it can immediately begin to corrode a persons heart, likely killing him unless he had some type of trick up his or her sleeve. Although it doesnt seem like it, the process of releasing the particle into the persons heart can be incredibly fatiguing, and takes a good bit of reiatsu and stamina to complete. Zanpakuto Release Phrase: Shoot to death, Shinso. History: Gin had a very full history. He made his first appearance when he met Rangiku, Matsumoto, a lieutenant now, lying on the street, and befriended her. After a bunch of unimportant side stuff, he continued living a normal life in Rukongai, but, eventually found Aizen, being the one who had caused Rangiku to be on the road, and promised that he would kill that man. Gin had great potential, and was taken by Aizen after graduating from the academy at an incredibly young age - A genius, some could call him. He continued to embark on his adventure in the soul society, and eventually became the now 5th squad captain, Aizen's, lieutenant. 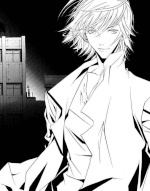 Eventually, he left from the fifth squad and became captain of the 3rd squad, with his lieutenant, Kira Izuru. After continuing his plotting and growing more powerful with each day, he left the soul society with Aizen after a battle, stepped down from his captain position, and commanded the Arrancar army with Aizen. Personality: He has an incredibly gentle and creepy personality. You cant really tell if he's happy or sad with his eyes closed and that gigantic smile crowding his face all the time. He seems to not actually like battling with others that much on the inside, but simply does what needs to be done. Oh, no. Ichigo defeated Aizen AND Gin? Boy, did I just waste 30 minutes making this, then. How terrible. Let see... Hm.. Uh.. I guess I should add to there, "Gin is awesome, therefore he survived his death and appeared randomly in a mooses' rump.